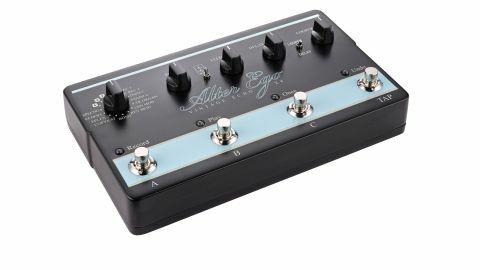 For vintage delay connoisseurs, the Alter Ego X4 is a dream come true, with emulations of some of the best echoes committed to tape. Easy to use. Vintage echoes sound spot on. TonePrint slots mean contemporary sounds are within easy reach. TC's Flashback X4 Delay is already a pedalboard mainstay, but with the Alter Ego X4, the tonehounds at American retailer Pro Guitar Shop have assembled a collection of carefully replicated vintage echo presets, including the likes of the Binson Echorec, Roland RE-201 Space Echo and Watkins Copicat. "There are 12 delay types in total, plus four slots to fill with TonePrints of your choice"
There are 12 delay types in total, plus four slots to fill with TonePrints of your choice, while the rest of the X4's functionality remains the same, with three assignable presets, tap tempo, a 40-second looper and a choice between true and buffered bypass. We have to hand it to the guys at PGS: they've nailed the essence of what makes these echoes great. Most notably, the Alter Ego X4 has a great line in modulated ambience, courtesy of the Echorec and Echoflanger settings, which lend notes a detuned haze, as do the 'new' settings, including 2290 with modulation and reverse delay with modulation. Likewise, the Deluxe Memory Man settings are spot-on, although we did find ourselves hankering for a modulation depth control from time to time. Elsewhere, the Copykat's warm, crunchy echoes impress, but the EPlex 2 is the real star of the show, with a glorious tape decay to its repeats. There's no denying the high quality of this collaboration: the Alter Ego X4 is packed with classic sounds that span decades of recording, plus the addition of a few new ones to boot. Combine that with the X4's simplicity of operation and intuitive looping, and we can't help but recommend the Alter Ego X4.